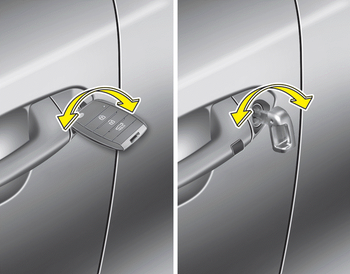 If the transmitter or smart key does not operate normally, you can lock or unlock the doors by the mechanical key. Insert the key into the key hole of the outside door handle.Turn the key toward the rear of the vehicle to unlock and toward the front of the vehicle to lock. If you lock/unlock the driver’s door with a key while the power door lock switch does not operate normally, only the driver’s door will lock/unlock. Once the door is unlocked, it may be opened by pulling the door handle. If people must spend a longer time in the vehicle while it is very hot or cold outside, there is risk of injuries or danger to life. Do not lock the vehicle from the outside when there are people in it.